Steel and machinery are two crowning results of industrial power and ingenuity. 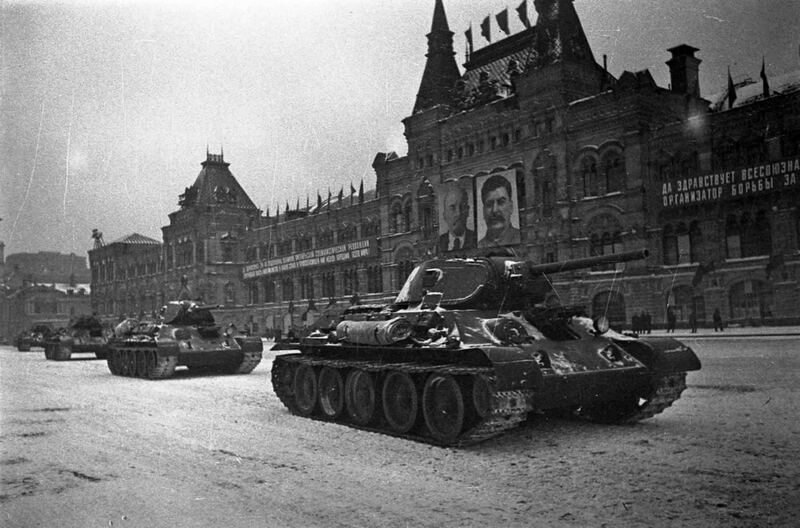 With Stalin’s first Five Year Plan complete, the USSR had reached a level of industrialization achieved by few other nations.Pictured above is a parade of Soviet T-34 battle tanks. This beast of steel was the Soviet’s primary battle tank from 1934 through World War Two. The tank, in many ways, was a mobile example of industrial prowess and served as a testament to the success of the industrial system of the USSR. The latter half of the 1930’s saw the USSR begin to drastically increase their military output. With a looming fascist threat to the West and a constant border dispute with Japan to the East, the USSR retaliated in the seemingly only logical way. They built a bigger, more threatening army to project their power and establish the precedent that the Soviet Union was not a nation to turn a blind eye to military threat. The image and meaning presented here is deep and interesting to say the least. The major idea of the stanza is the might of the Soviet tank, and its ability to easily throw down its challenger on the field of battle. The closer we look at the poem, however, the more interesting these lines become. For many years “fire and steel” were words used to describe the Japanese proficiency at steel forging. The samurai’s katana is, to this day, regarded as one of the finest examples of steel craftsmanship the world has seen. The poem implies that the fire and steel represents the Soviet battle tank. It can then be inferred that the Soviets are making the bold statement that their proficiencies with steel have surpassed that of the Japanese. Furthermore, the Japanese samurai was long regarded as the most elite, most disciplined warrior in the world. To compare the Japanese forces to these figures in 1937 serves two causes. The first implies that the Japanese have done little to progress themselves from the feudal age which saw the height of the samurai and their power. Secondly, it uses the notoriety of the samurai’s fighting prowess to demonstrate the power of the Red Army. The fact that the Red Army so easily casts aside this foe that is hallowed in history gives the reader the idea that this army is the greatest to ever be fielded. With the optimistic view presented of the Red Army in the poem, we gain a glimpse at anew mindset developing within the USSR. This idea is known as New Patriotism and uses history (primarily that of the military) to establish a sense nationalism in the people of the USSR. Below is a clip that demonstrates New Patriotism as taught in schools around the USSR. This video serves as an excellent example of the scope of the ideal of New Patriotism. The Party sought to implement it into the lives of its people starting at quite a young age. 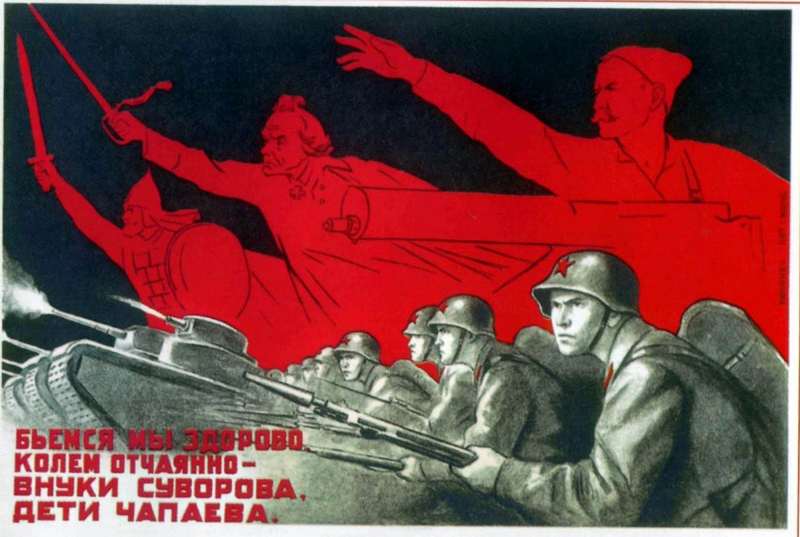 This idea of putting such an emphasis on the military exploits of the nation and teaching it to such a young audience may be questionable, but it served as a way to unite the people under the common idea of Soviet military excellence. In a time where the environment and atmosphere of the USSR can only be described as bleak, due mostly to the purges and threat of war on two fronts, New Patriotism served as a way for the people to reestablish faith and hope in a nation that seemed to be hurt on the inside and trapped by enemies on the outside. The ideals of New Patriotism would be echoed throughout the USSR through World War II and into the Cold War. These posters from 1943 represent the concept of New Patriotism and how it continued to effect the USSR past its inception in the late 1930s. Each poster is centered around soldiers in the Red Army and in the background, we see heroes from wars past. 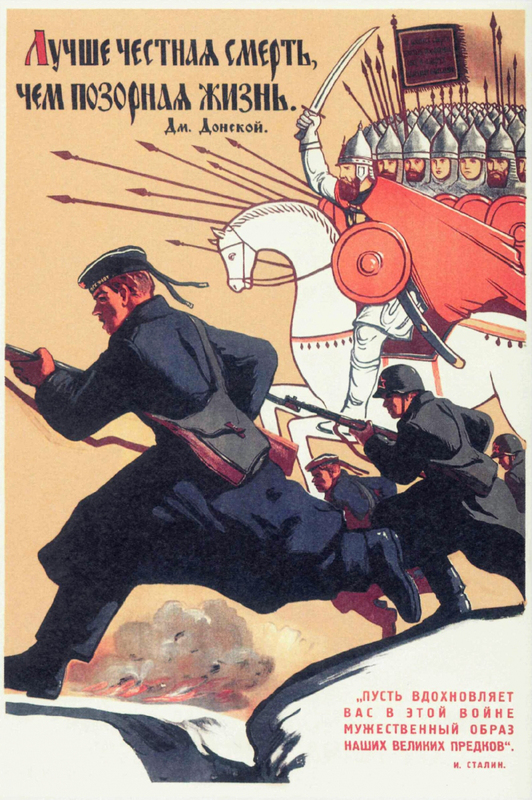 Wether it be the Mongols, Peter the Great, or heroes of the Bolshevik Revolution, they are all backing the “heroes of today”, or the men currently fighting for the USSR. The poem, the video and these posters help frame the mindset of the USSR with regards to their military and its role in the world. These works define the ideal of New Patriotism and the importance that military history played in the education of the younger generations. This ideal served as a way to hone the people’s minds to support the cause of their motherland. New Patriotism gave the people of the USSR a way to grow nationalism in a time when their nation seemed down. It gave them a flicker of hope in an otherwise dark night. You covered a lot of ground with a variety of sources! I enjoyed the excerpt of the poem you provided, and thought both the poem and the posters capture the messages of nationalism, militarism, industrialization and modernism. All three posters seem to allude to the past in the background, while the forefront displays the USSR’s modern capabilities and military power, illustrating the region’s history and progress from medieval-style amour to heavy machinery. You found a lot of great sources for this post, which is really good! I like how you found so many connections to how the USSR was building up for war so well. You can tell in the pictures how they were trying to link the new soldiers to the old heroes that brought the beginning of the soviets. This is just motivation for the new generation to pick up where their ancestors left off, fighting for the safety of this “great” communist government. Great post! The idea of Soviet military might being ramped up in response to exterior threats really seems to be a heavy theme here, and it seems to always be the Soviet reaction to any threat from the outside; real or imagined. 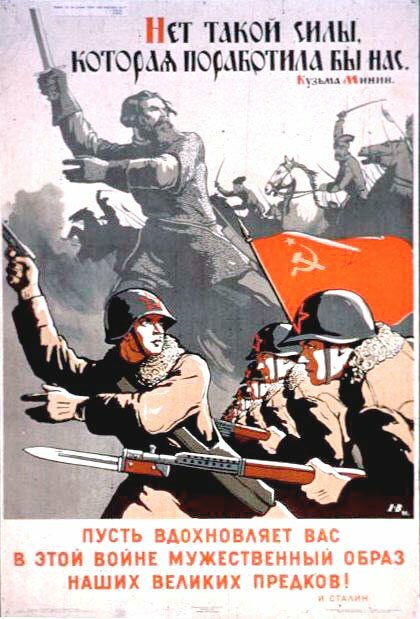 The concept of New Patriotism is one that i focused on in my post personally, in addition to propaganda featuring nameless soldiers, the Russians also created heroes of war much like they created heroes of labor, and leveraged their accomplishments to drive others onward.